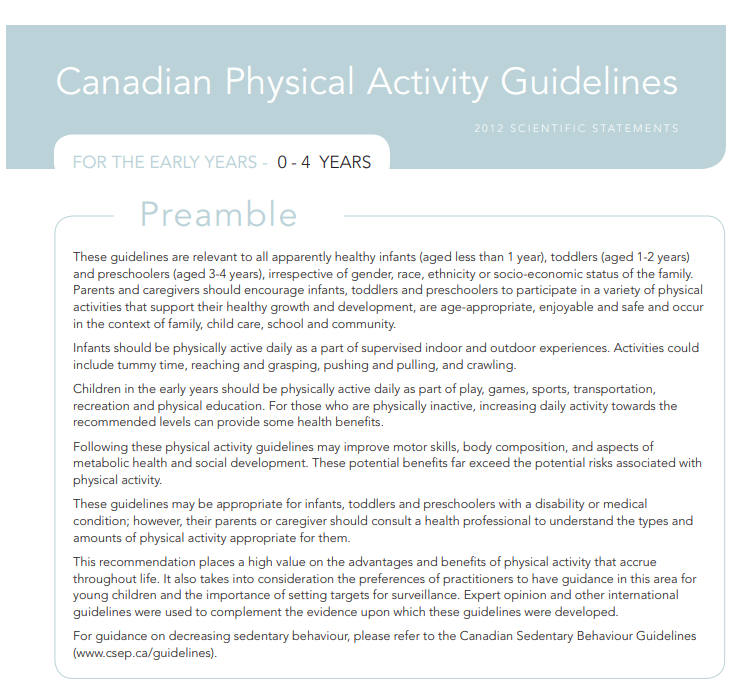 In 2012, the Canadian Society for Exercise Physiology (CSEP) published physical activity guidelines for children 0 to 4 years of age. These early years guidelines were divided into three categories: infants (aged less that 1 year), toddlers (aged 1 to 2 years) and preschoolers (aged 3 to 4 years). The guidelines recommend that for healthy growth and development infants should be physically active several times daily – particularly through interactive floor-based play. Toddlers and preschoolers should accumulate at least 180 minutes of physical activity at any intensity spread throughout the day, progressing to at least 60 minutes of energetic play by 5 years of age.